Neither Iran nor the West are friendly with ISIS, but if an Iranian cartoon contest is any metric, their mutual enemy is not pushing the powers closer together. Beginning last week, Iran’s government-funded House of Cartoon held the International Daesh Cartoon Contest in an effort to mock and deride ISIS and its perceived backers, namely the United States and Israel. Eight hundred cartoons were submitted from at least 40 countries around the globe, including far-off countries such as Brazil, Australia, and India. 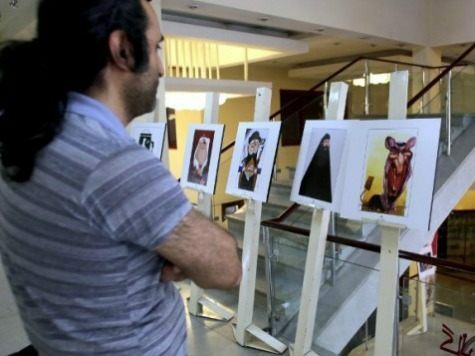 Mohammad Habib, the executive secretary of the contest, told the Tehran Times that several of the foreign cartoonists would attend in person but that they traveled under pseudonyms to avoid concerns that they would be targeted. Only last month, a “Draw Muhammad” cartoon contest in Garland, Texas, was the target of two ISIS-sympathizing terrorists, although local police forces stopped the attack. Popular targets for lampooning include former U.S. Secretary of State Hillary Clinton, British Prime Minister David Cameron, and ISIS “Caliph” Abu Bakr al-Baghdadi. The winning entry depicts Saudi King Salman holding a rattlesnake—a metaphor for the Saudis’ alleged support of ISIS. “I show King Salman, who has many supporters among Westerners, as he actually is—a venomous snake who can actually kill,” the cartoon’s creator, Sharham Shirzadi, said. Iran’s theocrats come from the Shiite denomination of Islam, whereas ISIS adheres to the Sunni branch of the faith. Divisions between the two stretch back nearly 1,500 years to a disagreement over who should succeed Muhammad as the leader of the Islamic religion. Over time, the denominations have grown more and more politically and theologically different. Previously, the House of Cartoon held a competition centered on the theme of Holocaust denial in response to Charlie Hebdo’s depictions of Muhammad. They held a similar contest praising Holocaust denialism in 2006, as well, which was condemned by Jewish leaders around the world. Iran is near-universally recognized as one of the least-free countries on the planet when it comes to speech issues. It ranks second for the most-jailed journalists and seventh for highest level of censorship, according to the Committee to Protect Journalists.